How Many People Were Really At WWE Super Show-Down? WWE massaged the figures a bit. Shocker! Such is their tradition for tooting their own horn, WWE were sure to crow about the attendance during the Super House-Show Down Under event in Melbourne yesterday, citing it as an impressive 70,309. It turns out - as you may expect, given their other tradition for talking utter bullsh*t - that this number was ever-so-slightly massaged. Speaking after the show on Wrestling Observer Radio, Dave Meltzer pegged the figure at the 62,000 mark - still a hugely impressive draw by any measure, but one which fell someway short of the proposed attendance WWE had been promoting on recent television. Super Show-Down's venue, the Melbourne Cricket Ground, boasts a maximum capacity of 100,000. 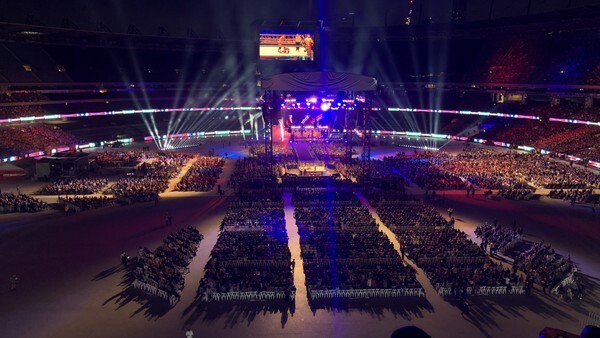 Even reconfigured for wrestling, the stadium was not quite full on Saturday, explaining WWE's decision to mask most of the mile-wide top tier in shadow. Nevertheless, the company were reportedly aiming for a 60,000 crowd, and managed to surpass it. But they still couldn't help lying about it. Going by official records, Super Show-Down's draw is WWE's highest outside North America since SummerSlam '92, which attracted just over 80,000 people to London's Wembley Stadium. In 2002, the company brought 56,000 people in to Melbourne's Colonial Stadium - though again, it's hard to know for sure if this figure is the real deal.